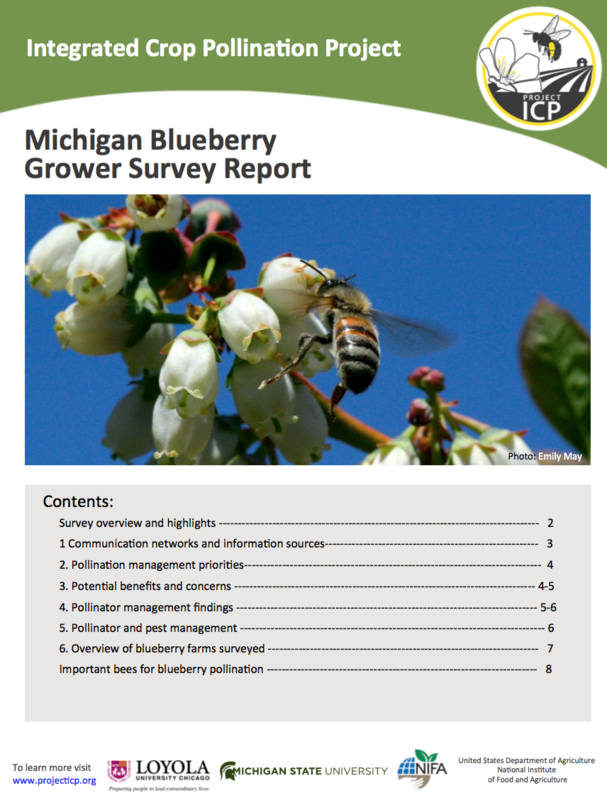 The Integrated Crop Pollination Project has released a summary report from its 2015 survey of Michigan blueberry growers’ pollination practices. The survey of 240 blueberry growers delved into growers’ goals for pollination management, networks of information sources about pollination, and past, current, and potential future practices related to managing and supporting pollinators on blueberry farms. Researchers also surveyed growers in other crops and regions around the United States, allowing them to draw comparisons between pollination practices in different growing areas. The research team will be conducting a follow-up survey in late 2016-early 2017 to continue learning about pollination management practices in the areas surveyed in 2015. “We’re especially interested in understanding factors that can help catalyze use of on-farm habitat—like planting flowering or flowering cover crops—that can support pollinators,” says Dr. Garbach. Information sources: Michigan blueberry growers get information on crop pollination from a variety of sources. Growers reported that beekeepers, other growers, and Michigan State University Extension were the primary groups they communicated with about pollination management. Personal relationships provide key support for learning about pollination management, in addition to personal experience and written materials – especially extension publications. Pollination Goals: Michigan blueberry growers’ most important goal for crop pollination was achieving consistent, reliable crop pollination. It may, therefore, be useful to frame grower-oriented communication about pollinator friendly farming practices in terms of this goal. Managed pollinators: The majority of Michigan blueberry growers (71%) reported buying or renting managed bees, with most growers using managed honey bees. Some growers also used combinations of honey bees and wild bees or managed bumble bees, or managed bumble bees alone. The average honey bee stocking rate for 2014 was 2 hives per acre and growers paid $52.30 ± $1.30 per hive. Growers with large farms were more likely to buy or rent bees than small growers. Attracting diverse pollinators: In addition to renting or buying honey bees, growers reported using practices that provided floral and nesting resources for pollinators (e.g. maintaining natural habitat, using cover crops, and leaving areas of reduced tillage–which can help support nesting habitat). Practices to attract diverse pollinators—including planting flowering cover crops, planting wildflowers along field edges, leaving fallows, and retaining natural habitat—were thought to improve crop pollination. However, weeds, pests, and costs were reported as concerns. Addressing these benefits and concerns may be useful to support growers’ adoption of practices to attract diverse pollinators. Pesticide management: There is widespread use of pest management practices designed to minimize impacts on bees, including modifying the timing of pesticide and fungicide applications to minimize impacts on bees and making an effort to choose active ingredients that have the least impact on bees. This suggests that pesticide impact messages have been highly visible. For more information, read the summary report here.